2000AD and Tornado comic Prog 171 (2 August 1980) | 'TAIN'T THE MEAT… IT'S THE HUMANITY! I’m currently reading The Art of Judge Dredd, a 272 page hardback that collects covers from 2000AD, the long-running weekly British sci-fi comic, that feature the title’s best known character. While reading the book (which is well worth a look) it occurred to me that it’s a shame the book concentrates solely on Dredd, and not on some of the other great covers from the comic’s 38 year (and counting) history. So, in the spirit of redressing the balance, I thought I’d showcase one of my favourites. 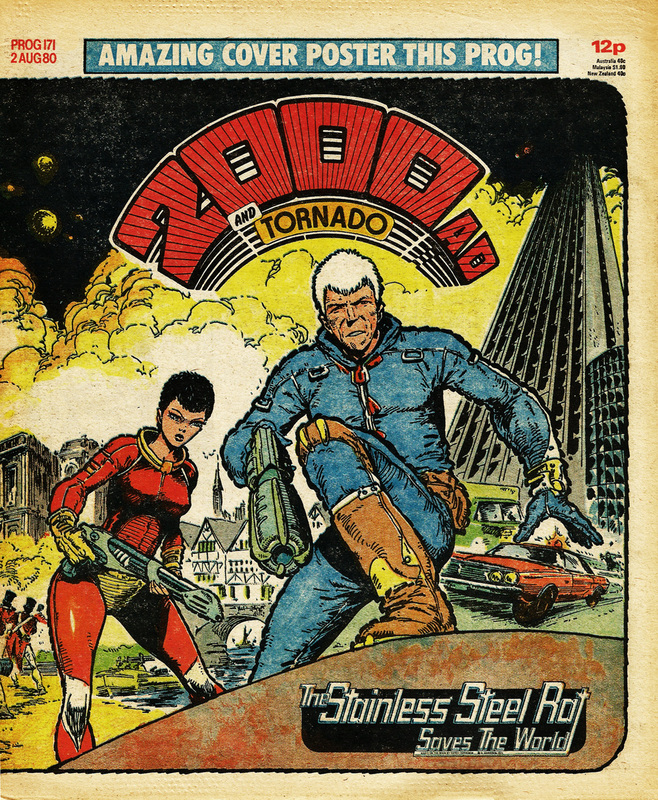 The cover to Prog 171 of 2000AD and Tornado, issue dated 2nd August 1980, featured Harry Harrison’s Slippery Jim DiGriz, aka The Stainless Steel Rat alongside his ex-psychopath wife Angie. The pair star in The Stainless Steel Rat Saves The World, the comic’s second serialised adaption of Harrison’s time-travelling rogue. The artwork was by the incomparable Carlos Ezquerra (who co-created Dredd) and he did a terrific job – there’s plenty of impact on the front cover and the overall image is dramatic and action-packed. 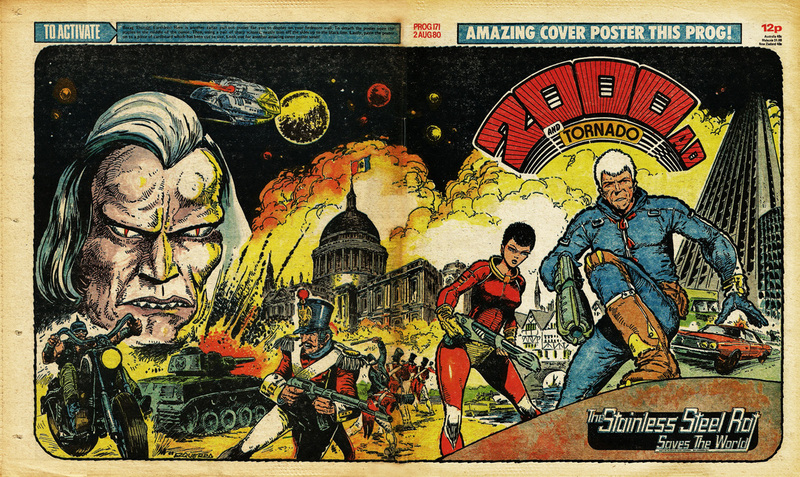 The cover featured one of 2000AD‘s popular wraparound cover posters (there are instructions on the back cover on how to ‘activate’ the poster by removing the staples and glueing the cover to some cardboard) and is easily one of my favourites. It’s also a great issue – apart from Slippery Jim (who bears more than a just a passing resemblance to James Coburn) Prog 171 featured The Mind of Wolfie Smith (a strip that ported over when Tornado was folded into 2000AD with Prog 127), Judge Dredd in part 16 of the classic Judge Child Quest, future war strip The V.Cs, and Robo-Hunter Sam Slade rounds off a memorable issue. I have a few more eye-catching covers from 2000AD and I’ll be posting them in the next few weeks. In the meantime enjoy this gem from 30 years ago.